« There’s Always Room for Jello! We’re really lucky to have a walk-up attic in The Old Man. It has its own door off the second floor hallway, and the stairway up has got plenty of height to it. 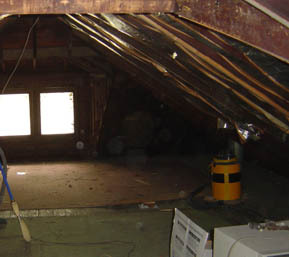 The attic itself is about 8 feet at the peak, and tapers down to the floor on the North and South sides and the East and West sides have dormers with double casement windows. The Long Term Plan is to dormer up one side and make it into finished living space (essentially, another bedroom or study). 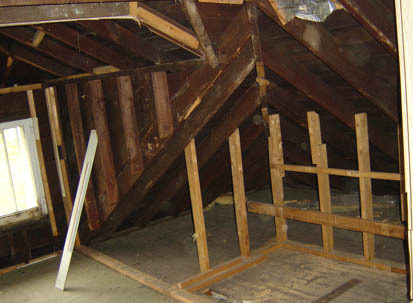 The attic is the sole area of the house that we’ve left untouched since we bought the house. We don’t really need it for storage or living space at the moment, so we’ve closed the attic door and concentrated on working on the rest of the house. Now that we’ve started getting quotes for central air-conditioning, we have to get the attic into a state suitable for the A/C contractors to work in, and as with most everything else in The Old Man, that means demolition. 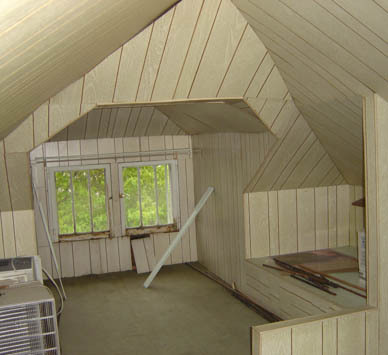 At some point in the past–I’d have to guess the early 70’s–one of the previous owners built a room in the attic. This room basically consists of some amount of R14 fiberglass insulation, furring strips, studs, and liberal amounts of lime green panelling. The construction included two built-in platforms that seem about the right size to hold single beds. Lastly, there is an enclosure built over the stairwell to contain The Big Red Fan of Death (more on that in a later post). This left a small amount of unfinished space in the back of the attic (accessible through a door, also covered in green panelling). 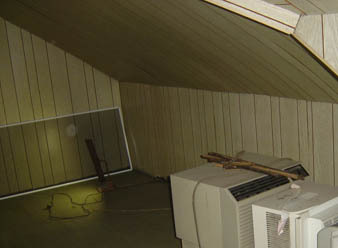 The windows in the back part of the attic have fixed masonite louvers on them (outside), presumably to behave as an outtake for The Big Red Fan of Death when it was running. So this Saturday, our nephew S. and I headed up into the attic with tools and the Shop-Vac and started ripping everything (except for the fan) out. We vacuumed a corner of the unfinished part of the attic and stacked the old storm windows and french doors there while we started tearing everything else out. We pulled down sheet after sheet of panelling, knocked down the studs one at a time, and pulled out strips of insulation. After about 4 hours, we had a tremendous pile of garbage in the back of the attic and had finished about 3/4 of the demolition work. We now had to get all of this out to the alley and into the garbage. 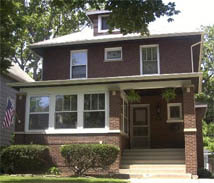 Looking towards the front, before and after. We had two choices for getting the trash out: Make dozens of trips down through the house with armloads of dusty dirty wood and panelling, or chuck everything out the window and into the backyard. I’ll give you one guess as to which one we picked. We tore the louvers out of the back attic windows, and this gave us a clear path to the backyard. While we took turns throwing 2×4’s, furring strips, and bits of insulation out into the yard, we couldn’t toss the panelling out for fear that it would take wind and fly back into the house or even worse, into the neighbor’s yard. Looking towards the back, before and after. So I went down onto the roof over the breakfast room and S. handed me the sheets of panelling and I dropped them down into the backyard one at a time. After that, it was just a matter of picking everything up out of the yard (and replacing some king-size divots!) and getting it out to the alley. All told, the cleanup only took about 50 minutes. So we’ve still got a bit of work to do before we’ll have a totally empty attic, but we got a lot more done in five hours than I thought we would. Now where’s that bottle of Advil again? This entry was posted on Sunday, April 24th, 2005 at 4:00 pm	and is filed under Attic, Demolition. You can follow any responses to this entry through the RSS 2.0 feed. You can leave a response, or trackback from your own site.